Kris King has been nominated for Fundraiser of the Year at the 2014 Pride of Britain Awards. Kris has dedicated his fundraising to the man who raised him - Dr Phil Stavish. Phil died in April this year after battling Huntingdon's Disease. Shazhad Ahmed Athar from Sheffield has been nominated for Fundraiser of the Year at the 2014 Pride of Britain Awards. Since moving to South Yorkshire five years ago he has worked with youngsters in the city to raise money for a number of worthy causes. Paul Bottomley is from Sowerby Bridge in West Yorkshire. He has been supporting the Macmillan cancer unit in Halifax since his wife Jane was diagnosed with cancer two years ago. Shelley Richmond from South Yorkshire has been nominated for Fundraiser of the Year at the 2014 Pride of Britain Awards. Shelley volunteers at South Yorkshire-based dog shelter, Rain Rescue. Kevin Megson from East Yorkshire has been nominated for Fundraiser of the Year at the 2014 Pride of Britain Awards. He is hoping his work means other men won't go through his experience of being diagnosed with prostate cancer. Over the past five years he has raised more than £80,000 for Prostate Cancer UK and is active in giving workplace talks to make men more aware of the disease. Dr Kate Granger has been nominated for a Pride of Britain Award in the Fundraiser of the Year category. She has used her own experience of terminal cancer to help others. Grace Melody-Gardner reports. Mark Smith has been nominated for a Pride of Britain Award in the Fundraiser of the Year catergory. Mark's campaigning for cycle helmets to be made compulsory after his son was involved in an accident in Lincolnshire. Grace Melody-Gardner reports. The coach is travelling one thousand miles, up and down the country to let people everywhere nominate members of their community who do extraordinary things to help others. This years winner will be announced in October at a star-studded event in London. It's the night when Britain honours its unsung heroes. A star-studded ceremony in London when inspirational stories of bravery, courage and sacrifice take centre stage. 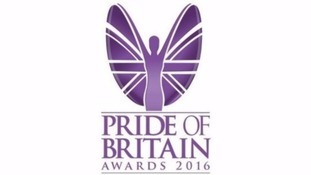 For one night only at the Daily Mirror Pride of Britain awards all the applause is for ordinary people doing extraordinary things. They're the stars - and the celebrities take a back seat. And it was a very special night for one of our region's veteran fundraisers. Daniel Harris was there.